Well, according to Wendell Cox at New Geography, anyway. But does it mean anything? After all, it’s mostly due to how readily the city annexes local rural areas, diluting our density beyond the norm. And when you look at Mecklenburg county, compared to other counties nationally, this distinction falls away. So it depends on how you cut the cake. Either way, an interesting read, via Mary Newsom at The Naked City Blog. There may be no better example of the post World War II urban form than Charlotte, North Carolina (a metropolitan area and urban area that stretches into South Carolina). 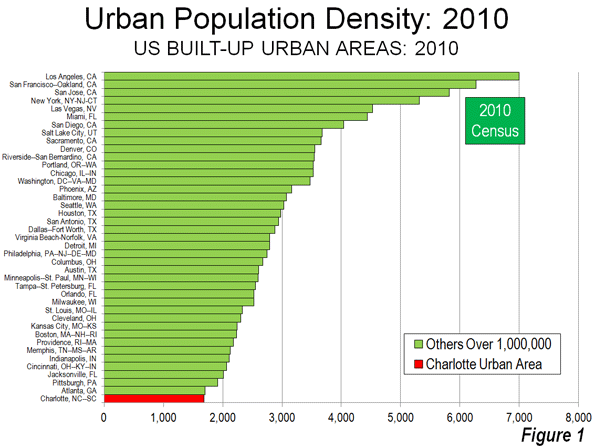 Indeed, among the approximately 470 urban areas with more than 1 million population, Charlotte ranks last in urban population density in the United States (Figure 1) and last in the world. According to the United States Census Bureau, Charlotte’s built-up urban area population density was 1685 per square mile (650 per square kilometer) in 2010. Charlotte is not only less dense than Atlanta, the world’s least dense urban area with more than 4,000,000 residents, but it is only one-quarter the density of the supposed “sprawl capital” of Los Angeles. Read more at New Geography.